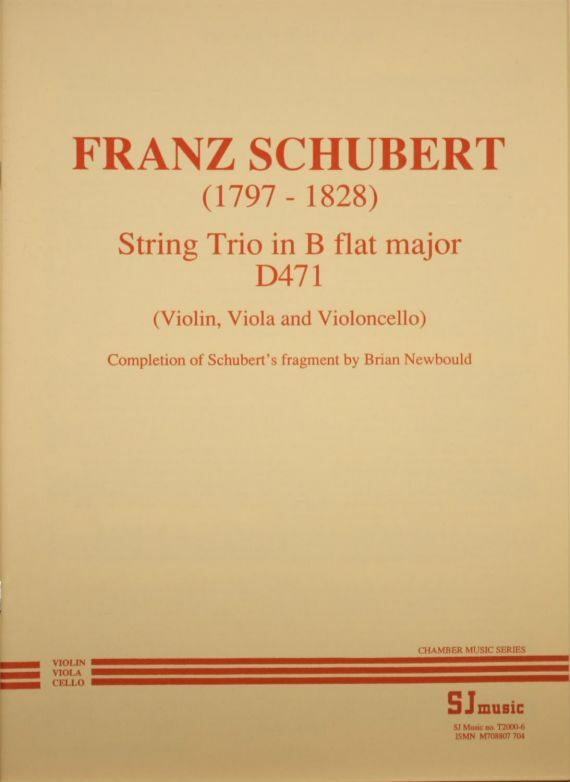 This string trio was only partly written by Schubert, and has been finished by the Schubert expert Brian Newbould. It is a charming work, and Newbould has done a wonderful job in creating a full length trio in the style of Schubert and using quotations from other Schubert works, as Schubert himself did on occasion. The Schubert catalogue lists two string trios. The second is a complete work in B flat major (D.581), which survives in an autograph dated September 1817. The earlier work, also in B flat major (D.471), is a fragment dated September 1816 in the autograph. Schubert finished the first movement and wrote 39 bars of a slow movement in E flat major. There is no trace of a third or fourth movement. Schubert appears to have put down his pen early in the slow movement and never taken it up again. Brian Newbould’s completion of D.471, finished in July 2000, was commissioned by the Leopold String Trio. A full note about the creation of this piece is included as a preface in the printed music.